“Choose a job you love, and you will never have to work a day in your life.” This is one of the few Confucius sayings with which I can fully identify. Although I suppose I’m not actually the best judge on that front, as I have only had jobs in academia throughout my life. The closest I’ve had to a “regular” work is tutoring during high school along with some volunteering and extracurricular organizational work. Straight out of high school I began an internship funded by the National Science Foundation with Dr. Roland Kawakami’s group at the University of California, Riverside (UCR), and I have simply never stopped working in research. The Kawakami Group at Mt. 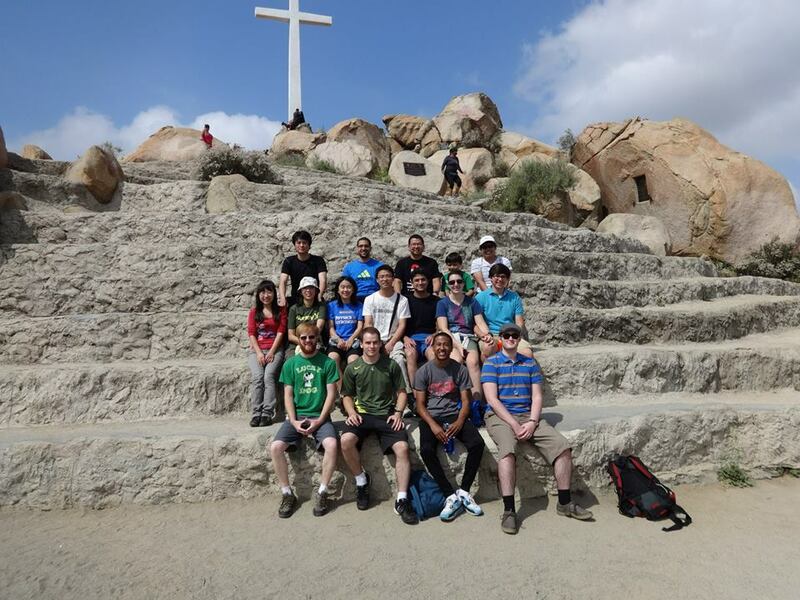 Rubidoux in Riverside, California. Dr. Roland Kawakami is in the middle of the top row and I am to the far right in the bottom row. To clarify, the positions I’ve held, both at The Ohio State University and at UCR, fall into the category of experimental condensed matter physics research, which is a fancy way of saying we study materials, ranging from your standard metals (iron, copper, nickel, etc) to the novel two-dimensional sheet of carbon called graphene. Now, “What’s so great about this gig?” you might ask. Physics, and other more math-centric scientific concentrations (engineering, computer science, etc) depend more on application and evolution of knowledge, as opposed to memorization and technique. I prefer it this way, it makes being bored a rare occurrence. When you are working on a specific project, it is normal that the methods and even the goals change as you go, and the results are often quite beautiful. 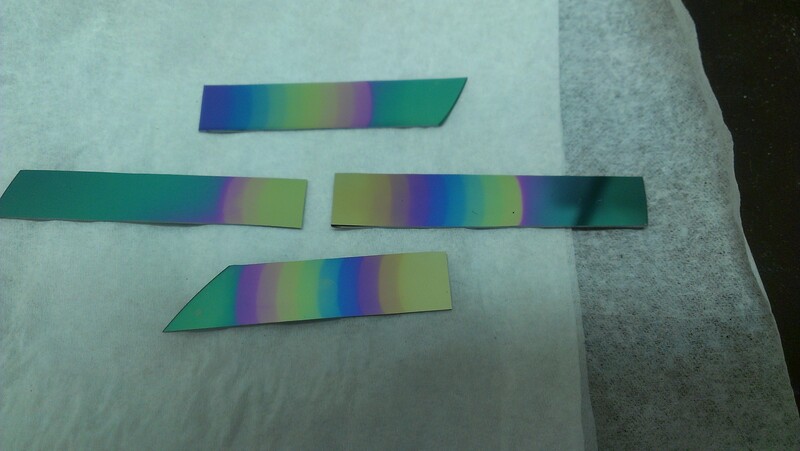 Part of my summer project at OSU, acid-etched silicon wafers resulting in a vibrant rainbow pattern. One of the main factors keeping me interested in this profession is the constant evolution that other jobs seem to lack. I often feel slightly left out when I hear friends and colleagues discussing past jobs and experiences, however I can’t imagine myself enjoying any other job. My understanding is that most “normal” jobs, such as clerical, retail or restaurant positions, involve extremely repetitive tasks or routines. In my 2 years working at UCR’s Nanoscale Spintronics Laboratory, the closest I came to having a routine was regularly producing graphene samples, and even then there were constant changes from problems cropping up, improvements being made and needs evolving. This constant adaptation is the way of things when you are working on scientific research, as our work generally does not extend beyond a fundamental understanding. I (and most scientists) are like children in this way, we tend to be distracted by shiny new things, almost never being involved in application phases. I would like to be able to give a run-through of what an average day of work is for me, but the truth is that I never have an average day. 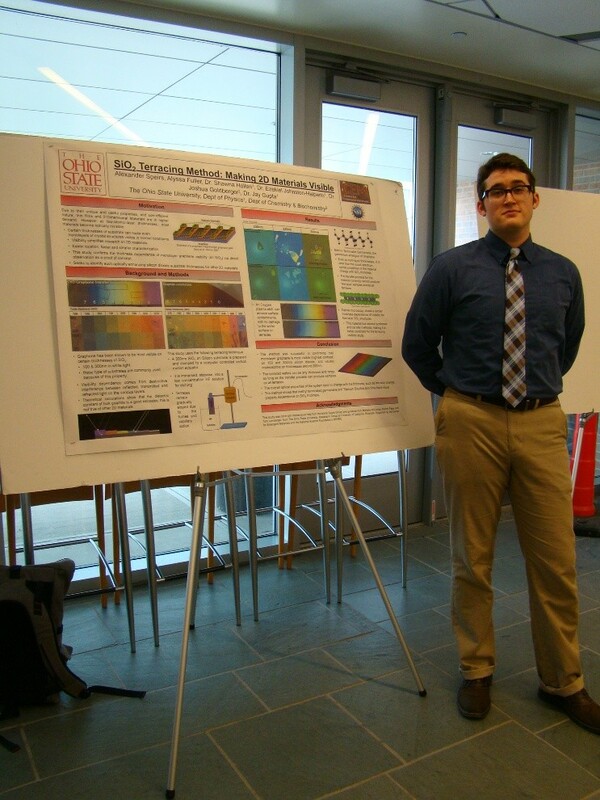 As an undergraduate in research, I often shadow graduate students in their efforts, learning and contributing where I can, but their days rarely go as planned either. This is another aspect that makes this path desirable for me: everyone is constantly learning. Even our “boss” (the Professor or Principal Investigator) constantly adapts to new information. For instance, when our vacuum chamber was disabled by a procedure involving reactive gasses, many members of the group, including the Principal Investigator and myself, quickly decided to shift the study and procedure to the furnace system which I was currently working with. 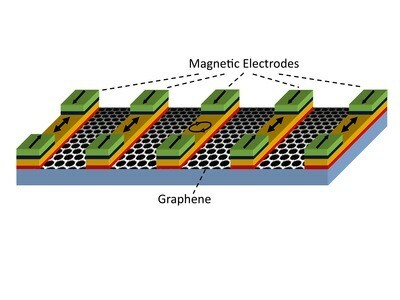 The proposed electronic device for a collaborative project of which my graphene production focused on. In my spare time, I enjoy building things, from circuits and models to more radical projects such as a ten foot tall trebuchet. This is likely another reason I enjoy my job so much, because it’s similar to my hobbies, but on a much more fundamental level. I like to call many of my projects “big boy Legos”, such as designing and building an extruded aluminum and steel frame to protect us from potential explosions in the lab. Even my graphene production essentially involves stacking carbon and other materials such as metals or semiconductors, but on the atomic scale. One of the main differences is that now I get to play with much more expensive and potent toys. For instance: when moving lab locations at UCR, I was handed one small piece of equipment from our extremely large and complicated vacuum chamber; I was then told that it was worth over twenty thousand dollars. Needless to say, I am very careful around even the most basic looking items in the lab. I also get to work with ultra-high vacuum systems, flammable gases, reactive substances, high voltages and corrosive liquids on a daily basis. I believe that if I were to switch careers, anything else would just seem boring by contrast. 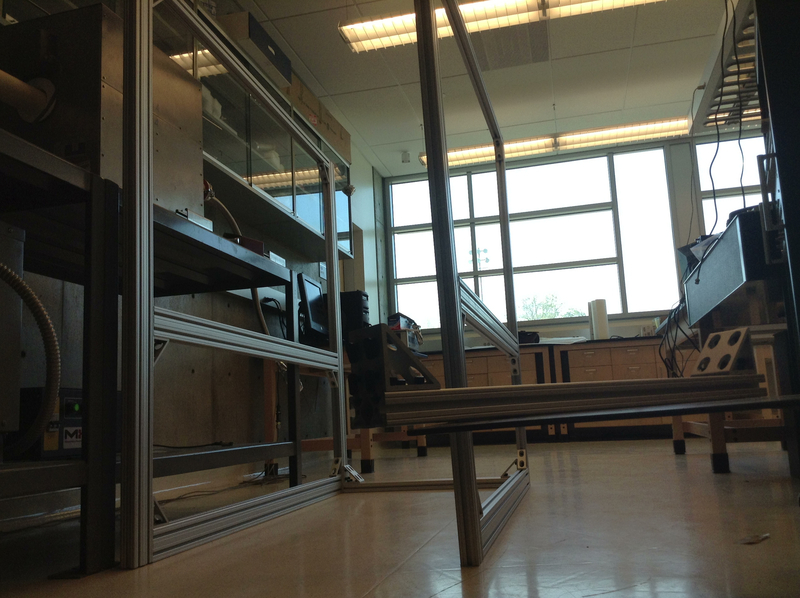 Big Boy Legos: An extruded aluminum frame to enclose the lab’s furnace (upper left). An example of the expensive component: an atomic hydrogen source. Source: SVT Associates, Inc. I doubt that I will ever leave the sciences, for a reason told best by Richard Feynman: “You say you are a nameless man. ** You are not to your wife and to your child. You will not long remain so to your immediate colleagues if you can answer their simple questions when they come into your office.” There is a definite joy and meaning in simply being able to answer questions and expand knowledge. Despite a certain arrogance that comes from physics being the “purest” science, it is certainly impossible to say that any one person is more knowledgeable than another. In most meetings that I’ve attended, everyone in the room is the resident expert on some aspect, facet or procedure. That sort of identity and importance is very endearing, and leads us to be more productive, more invested in ourselves, the group, and the research. With all of this in mind, I hope to always have a career in this field, it is always interesting and exciting. **Remember, women are physicists too! Born and raised in the desert valley of Riverside, California, I was inclined to stay indoors to escape the relentless heat and sun. I read lots of books, played lots of video games, and watched lots of Discovery Channel. I still do all of these things, but currently my focus is on my undergraduate studies at the University of California, Riverside, and on my research projects as well as my officer position in the student chapter of the Materials Research Society at UCR. I play bass guitar, enjoy cooking, programming, building and blowing things up, and the occasional physical activity (football, frisbee, rock climbing) or beach trip.